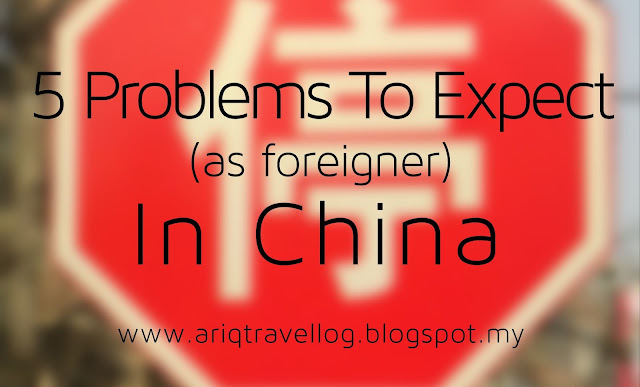 Facing all sort of problems while traveling in foreign country is a common thing for everyone. Sometimes the problems are so tiny that you can deal by ignoring it. While some, they are just too big that they will interrupt your traveling experience. One thing that I do to lessen this type of crisis - it is to identify the worst possibility I will face. Here are the five things I notice people who traveled with me faced during their first visit to China. This problem implies on either those who speak Chinese, or those who don't. The country itself is huge, hence, you may expect the accents produced by it are plenty. Just when you think you understand Mandarin or Cantonese, there come Hakka and Hokkien. Being in a job which involves massive communication, I always prepare myself with little of each accent. A little of everything could eventually help you out during desperate time. But if you don't speak any Chinese, you might as well go to Youtube, or anywhere on the internet, and learn some tiny words. There is a slight possibility that you will face locals that refuse to speak English. Mostly it isn't because lack of knowledge in the language, they just refuse to speak it. I believe this doesn't only happen in China. But to those travelers who grew up in a country with well-mannered drivers all around the neighborhood, you definitely be surprised with the road rage here. In my worse experience while taking a taxi in Beijing, we nearly got into a highway accident when a car came out of nowhere from our left side. The taxi driver put a brake real hard when he saw it that the car actually spun to the side. Funny part was that the two drivers had a quick argument afterward and resume the driving like nothing ever happened. My intention here is not to scare the travelers away. But if you really have to get a taxi or any pick-up service, just let yourself aware of what to expect. It is a common knowledge that the main dining tools used by locals are chopsticks. The do have spoons, but most of the cheap diners, they do not have forks, let alone knives. Interesting part is that sometimes you even need to ask spoon manually even when you're ordering rice. My best advice when you decide to visit cheap diner, as I only seek for that type of place to eat, is to bring you own disposable chopsticks or spoons. You will never know what is happening at the back of the kitchen. China has a strong security when it comes to the internet. You may purchase cheap data or Wi-Fi package, but there is a massive limitation for website access. For instance, Facebook or Instagram are the most restricted applications. Some people made their conclusion and thought anything that wasn't produced by local corporation, especially those applications or websites from the United States, are not permitted. Unless those corporation had prior arrangement, then you might get to view them. Even Google Play is blocked sometimes. For those whose livelihood depends heavily on internet access, I suggest you to do this - Download every VPN you could get in Playstore or iTune, and activate them before departing to China. Some VPN's are only trial versions, but it will do you plenty of good if you were traveling for short period. Ultimate nightmare for Malaysians. If you were used to cleaning yourself using water in the toilet, you would have to be aware that you wouldn't be able to do so in China. Picture this, the toilets here are provided with only toilet bowl, flusher, and a roll or paper towel (if you were luck enough). There is no water hose for you to clean your hand, you feet or any part of your body. Personal advice, do bring a paper or plastic cup filled with water when you have to go for a quick business in the toilet. Also a tiny hotel soap if you could get one.